A good book leaves you thinking about it between reading sessions. A great book leaves you thinking about it after you’ve finished. A freaking spectacular book not only leaves you thinking about it, but colours everything that you try to read afterwards, and leaves you feeling slightly hollow, because the experience is over. 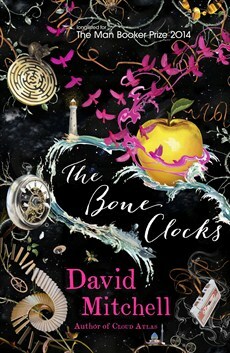 The Bone Clocks by David Mitchell falls into the ‘freaking spectacular’ category. As the page numbers started growing ever larger, I felt enormous internal conflict – on one hand, the compulsive desire to find out what happens, but on the other hand, the need to draw things out slowly, to savour every page and thought. I suspect the fact that the last book that really had that effect on me was The Luminaries is a very good sign for The Bone Clocks’ chances on the award circuit. Even now, days after I finished it, I think about the feeling of closing that heavy pink hardback after reading… and then opening it again, to re-read the final page – knowing that it was going to be a hard act to follow. Perhaps intentionally I have limited much of my reading since then to easily-packaged pop YA fiction (even when I have responsibilities to other books) – I don’t feel like I’m quite ready to fall into another story so deeply. The Bone Clocks is mysterious. It contains fantasy, but you wouldn’t dream of shelving it in an SF/Fantasy section. It’s epic and complex without being incomprehensible. It visits the past and the present, the real and then unbelievable. David Mitchell is a wizard. I have heard mixed things from others about his earlier books, so I’m a little wary of dipping my toe into those waters – after all, I would hate to taint the admiration that I currently have for the man. I’m loath to go into too much detail, because however I try to describe it, I won’t do it justice. Good and evil are more black and white than they are in some tales, and yet it takes quite some time to figure out precisely which is which. It’s about survival at any cost and in the worst circumstances. It’s about examining the way in which we treat our world. It’s about one person, and so many people at once. It is not a book to jump into lightly. You need to treat it carefully, give it the time that it deserves. If you peck at it bit by bit, you might not be captured by it as much as it deserves. Get yourself somewhere comfortable, allow yourself a decent chunk of time, make yourself a pot of tea or a plunger of coffee. Appreciate the beautiful design, both aesthetically, and conceptually. Be prepared to have people comment on how pink it is. Laugh gently, knowing that they have no idea what this pink tome holds. Then, when you’ve finished, pass it on to someone else to read, so it can inhabit them next. It’s what Marius would do. This is the first of (hopefully) several reviews of books longlisted for this year’s Man Booker Prize. Last year I only managed to sort out The Luminaries and We Need New Names – this year, I will hopefully manage to do the whole shortlist (all the better if this magical title makes it through to the next round – my hopes are certainly high).